In designing the cross which stands in the sanctuary, Father Rupnik wanted to depict how the fate of Adam and Eve who took the forbidden fruit from the tree in the Garden of Eden was reversed by Jesus Christ who was nailed to the tree on Calvary. The “tree of life” in Eden led to sin and death; the “tree of death” on Golgatha is the source of freedom and life. With his own death, Christ has destroyed the kingdom of death. While it is common for artists to represent the skulls of Adam and Eve at the foot of the cross, here we see Christ rescuing them both from hell. From the cross of Christ they are given a share in that life which they had tried to grasp from the tree in Eden. 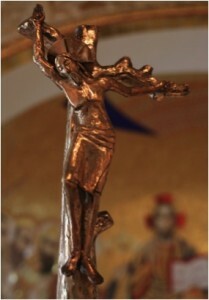 The base of the cross is formed by the roots of a tree, the tree of Jesse from which the Saviour comes.